During the first weeks of last August 2016 and after intense planning, the Siberian Student Chapter and the Barcelona Student Chapter put a beginning to their collaborative expedition fieldtrip. This consisted on the first collaboration with any other Student Chapters from part of the Barcelona Student Chapter and it could not have gone any better, consisting on a thoroughly planned and amazing week-long fieldtrip throughout Southeastern Siberia composed by seven members of each Chapter. During the first days the students had the opportunity to visit some important ore deposits of Siberia: the Kamenushikoe Cu deposit and the Salairskoe Pb-Zn deposit, located 300km from Novosibirsk in the Salair Ridge (Kemerovo Region), and Sinyuhinskoe Au deposit, located in northeastern Altai. The two types of ore commonly found at Salairskoe Pb-Zn ore field were characterized by massive carbonate-quartz-barite ore and disseminated barite-polymetallic ore whereas in Kamenushikoe Cu deposit ore minerals were represented mainly by pyrite and chalcopyrite. In addition, students had the chance to collect amazing hand samples of azurite, malachite and chrysocolla between others. On the other hand, at Sinyuhinskoe Au deposit, members were provided insights on the skarns of different compositions developed in tuffs and carbonate rocks in the contact zone with the Sinyukha massif, mainly on the wollastonite, garnet-wollastonite and pyroxene-wollastonite skarns associated with sulfide minerals. When interning into the Altai Mountains, the Siberian Student Chapter excellently guided the Barcelona members to both geological and cultural places of interest such as a) the largest natural history museum in Siberia; the “Paleopark”, b) the Cambrian – Ordovician Gornoaltaisk formation “Dragon’s teeth”, c) middle Devonian volcanites related to the continental margin in western Altai-Sayan foldbelt activity, d) a bewildering catastrophic glacial megaflood deposit called Inskoy “stone garden”, e) the beautiful confluence of Chuya and Katun’ rivers and its complex terraces, f) fossil-bearing Silurian limestones belonging to the Gromatukhinskaya series, g) petroglyphs of Turkic peoples (9000-6000 B.C), h) the Kol’ka Snegiryov Monument and j) the well-known Shirlak waterfall and the alluring blue lake near Aktash Village. Above all, we want to thank the SGA Siberian Student Chapter for their dedication, their guidance and for having provided and shared such joyful and memorable moments with us and to the SGA itself for having supported this collaborative expedition from the beginning. 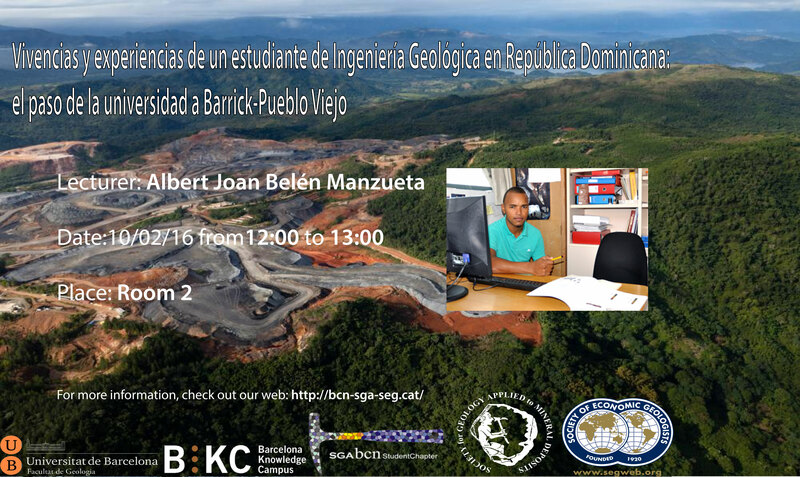 14/05/2016 BARCELONA STUDENT CHAPTER – SANT JULIA DE LLOR I BONMATI MINING DISTRICT FIELD TRIP (MONTSENY-GUILLERIES: GIRONA). 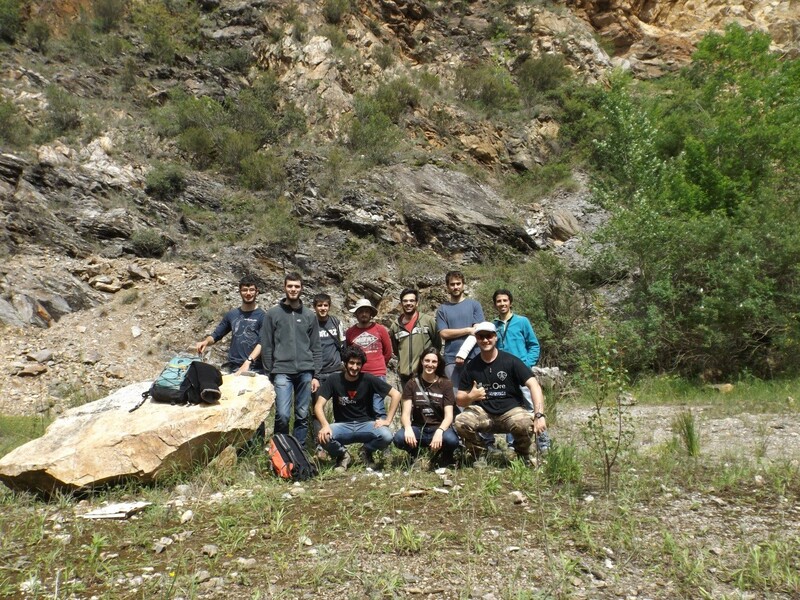 The past fourteenth of May, ten of our students went to a fieldtrip to Sant Julià de Llor i Bonmatí mining district. Located in the, Montseny-Guilleries region, this district had a great importance in the Spanish mining history, and was active during eighteenth, nineteenth and twentieth centuries (until 1972). The main objective of this fieldtrip was to study the “Puig de Sant Julià” open-pit mine, where F-Ba (Pb-Zn- Cu) mineralisations were extracted. These mineralisations are located in fracture-associated veins, strata-bounded layers and Cambrian to Silurian metasomatic marbles and calc-silicates (Skarns). The minerals that form the host rocks are mainly carbonates, such as calcite and dolomite, but there is also quartz, tremolite-actinolite, diopside and white micas (phlogopite and/or margarite). The minerals forming the ore deposits are mainly sulfides, such as pyrite, chalcopyrite and galena. Malachite, pyrolusite, melanterite and goethite are present, but as a product of sulfide alteration (supergene). Additionally, some barite veins are found cutting the host rock and ore deposits. The geochemistry of Ni in lateritic profiles and its relationship with the hosting minerals. The laterite deposits placed in the Caribbean contain a significant amount of Ni. Despite their geological relevance and economical interest, no detailed studies existed with regards to the mobility of Ni and its incorporation in their hosting minerals along the profiles. In the present talk, a set of results obtained by means of EMPA, µRAMAN, µXRF and µXAS from oxide type laterites from Cuba and silicate type laterites from Dominican Republic are presented. We studied the distribution of Ni in the limonitic and in garnieritic horizons to elucidate how Ni is accumulated in Mn-oxyhidroxides and within the Mg-hydrated phyllosilicates. The obtained results helped to explain the distribution and accumulation of Ni and the development of laterites from Moa-Bay and Falcondo Ni-laterite deposits. These studies also highlight how physicochemical factors such as soil porosity, pH regime and silica activity do have important implications for Ni accumulation and mobility across the profile. We are joyful to announce that our first members – the same who founded, started to develop and build our Student Chapter – have finished their doctoral thesis! After enduring years of intense dedication and laborious hard work, which include “the syndrome of PhD stress suffering” and “high peaks of registered enthusiasm and motivation”, Cristina Villanova de Benavent, Thomas Hans Aiglsperger and Marc Campeny Crego have finally completed with excellence their goal and undergone the best way possible this adventure. It’s unbelievable the way time flies: only some years ago these amazing people were on the verge of beginning a doctoral thesis – a complicated and hard path but, when looked back; it leaves you a great feedback of awesome memories, an enormous backpack full of experience and the undeniable feeling that by confronting this challenge you cannot fear working on new ideas and that whatever it may-be-to-come. You will take it and overcome it. From left to right: Cristina Villanova de Benavent, Thomas Hans Aiglsperger and Marc Campeny Crego. Cristina Villanova de Benavent with "Compositional and structural charaterisation of Ni-phyllosilicates in hydrous silicate type Ni-laterite deposits" on the 11th of December 2015 in the Aula Magna at 11.00 h.
Thomas Hans Aiglsperger with "Mineralogy and geochemistry of the platinum group elements (PGE), rare earth elements (REE) and scandium in nickel laterites" on the 17th of December 2015 in the Aula Magna at 11.00 h.
Marc Campeny Crego with “The carbonatitic volcanism of Catanda, Angola” on the 20th of January 2016 in the Aula Magna at 11.00 h.
Instead of undergoing a workshop consisting of several introductive lectures and a one day fieldtrip the Barcelona Student Chapter’s workshop of 2015 consisted of a two day field-workshop entitled“Ultramafic Ronda & Ojén Massifs: petrology, geochemistry and Cr-Ni-PGE associated mineralizations”. The whole field-workshop was developed in the two small massifs of Ronda and Ojén (Málaga) during the 11th and 12th of September. The peridotite massif of the Serranía de Ronda comprise three massifs (Ronda, Ojén and Carratraca) located in the westernmost internal zone of the Betico-Rifean Cordillera, which constitutes the westernmost segment of the Alpine belt in Europe. These massifs are made up primarily of lherzolite and harzburgite with minor dunite and pyroxenite layers. They represent portions of subcontinental lithospheric mantle tectonically emplaced at high temperature and high pressures into Paleozoic metasediments during the 20/22 Ma Alpine orogeny. Peridotites are zoned into three main lithological domains: a) spinel ± garnet tectonic domain, b) granular peridotite domain and c) plagioclase tectonic domain. A small group of members including undergraduate, master and PhD students was led by Prof. Fernando Gervilla; full professor of the University of Granada and Joaquin Proenza (advisor) during the whole fieldtrip (Fig. 1.). 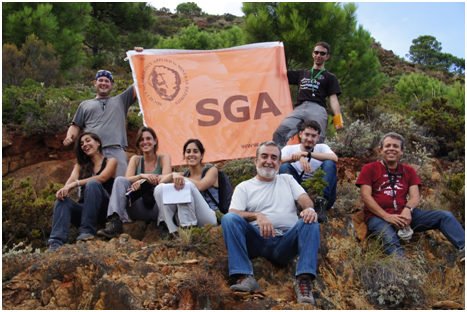 These students had the opportunity to learn from an invited professor who has dedicated years of his research on the study of the Ronda peridotites; and furthermore, recently co-authored “Liquid immiscibility between arsenide and sulfide melts: evidence from a LA-ICP-MS study in magmatic deposits at Serranía de Ronda (Spain)”. Fig.1. Groupal photograph taken in an outcrop characterised by chromitite and niqueline altered to annabergite mineralisation. Close to this outcrop spinelites mineralisation. The first day was devoted to a cross-section study of the orogenic lherzolites of the subcontinental mantle which crop out in the Ronda massif. Firstly observed; the garnet peridotites where graphite pseudomorphs after diamond have been described (Crespo et al. 2006). Later on; the spinel peridotite and finally the peridotites with plagioclase. Fig.2; Left image: Local acid diques of granitic composition. Right image: Gallega mine. Observation of chromite and niqueline mineralisations. Some of these veins also containing cordierite. 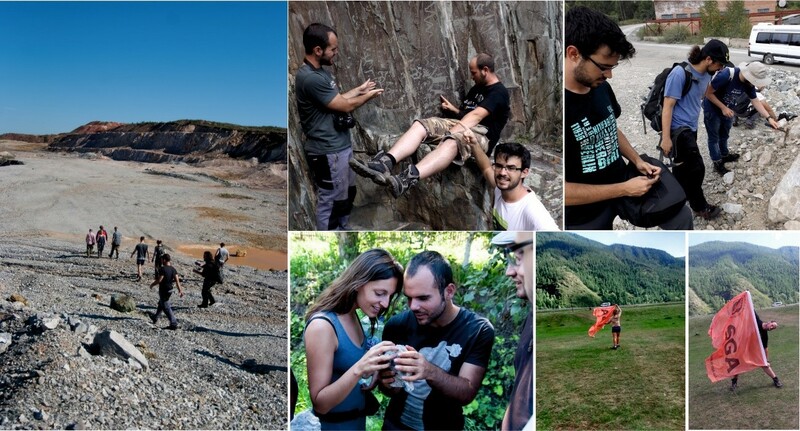 During the second day small chromite and Ni arsenide mines were visited: ex) Gallega Mine (Fig.2) where students had the opportunity to search for interesting hand-samples and acquire the experience of discerning between the diverse mineralogies present. 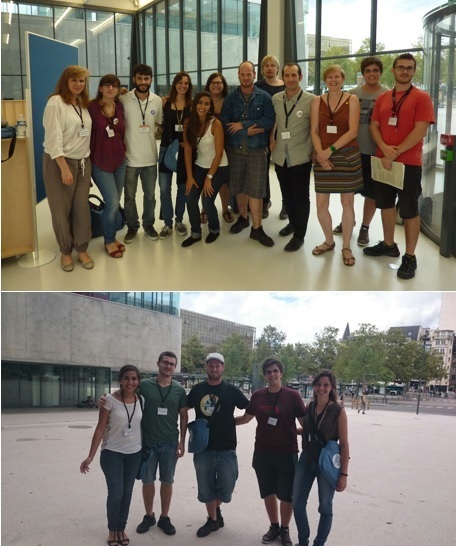 Finally 12 students comprising undergraduates, master and Phd attended to the 13th SGA Biennial Meeting at Nancy, France, which took place from the 24th to the 27th of this last August. They presentend i) poster or ii) oral research projects and Final Degree Projects (TFG). For some of them this experience was a reminder of other conferences, for others their first time exposing. Either way, everybody concluded that the time spent there was… just wonderful. The opportunity to meet experts of an specific field and entablish conversations, to attend to the diverse and rich oral presentations given by speakers from all around the world, the chance of presenting your own work and seeing others’, and finally getting to know people from other Student Chapters; all of it consisted in an amazing experience. 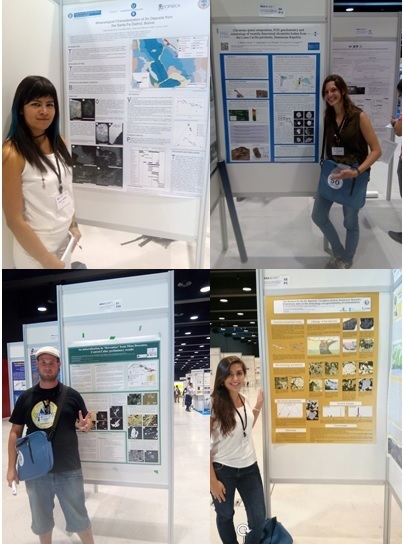 Daniel Rodríguez with “Au mineralisation in listvenites from a serpentinisedophiolite complex in Mina Descanso (Central Cuba)”, Mariona Tarragó with “Diffusion of heavy metals during vitrification of chromium sludge in a basaltic matrix: model of a melting pond in an alumina crucible”, Miriam Pastor with “The San José-Itos mines, Oruro, Bolivia: Structure and Ag-Sn Mineralization”, Lisard Torró with “Geochemistry of the VMS bearing Maimón Fm. (Central Cordillera, Dominican Republic): assignation to a fore-arc environment in a nascent intraoceanic island arc”, Cristina Villanova with “Ni-enrichment processes revealed by TEM imaging on garnierites”, Clara Román Alday with “The Romero Cu-Au-Zn deposits, Cordillera Central, Dominican Republic: Preliminary data on the mineralogy and geochemistry of mineralization”. 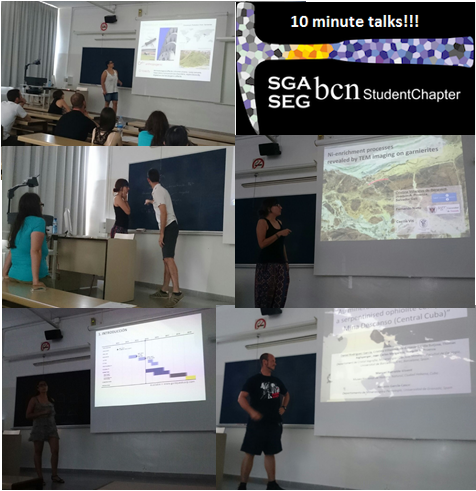 These presentations consisted in the exposition of final degree Projects (TFG), final master Projects (TFM) and even other post-master research projects, all of them resulting in succesful talks which enhaced motivation and participation within attendants. After these sessions a coffee stand was displayed and every participant could enjoy the company of our collegues and bid farewell to our friends before entering the forecoming summer. 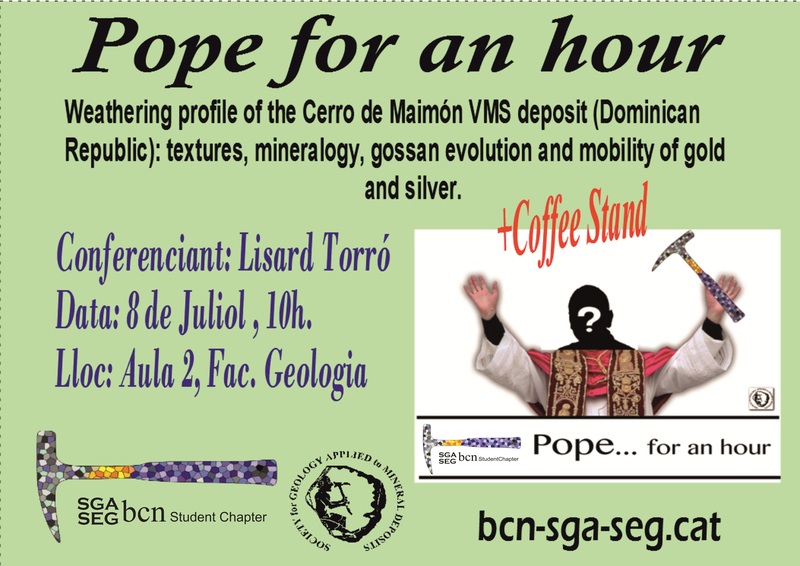 Weathering profile of the Cerro de Maimón VMS deposit (Dominican Republic): textures, mineralogy, gossan evolution and mobility of gold and silver. Cerro de Maimón, in the central Dominican Republic, is currently the only VMS deposit under production in the Caribbean region. It is hosted in the Maimón Formation, of early Cretaceous age, which is part of the oldest and chemically most primitive island-arc in the Caribbean. From bottom to top, this deposit can be divided into (i) a primary sulfide zone, (ii) a supergene enrichment zone and (iii) an oxidized zone. This study reports new data on the textural and mineralogical characteristics of the oxidized zone (gossan/leached capping zone) with emphasis in the Au-Ag-bearing phases. The mineral paragenesis of the oxidized zone is essentially composed of goethite, hematite, quartz and barite. Botryoidal, cellular and brecciated textures can be distinguished. Botryoidal and brecciated textures dominate in the upper parts of the oxidized zone, whereas cellular textures are more common in the intermediate and lower parts. However, the weathering profile is very heterogeneous. The leached capping profile shows evidence of both transported and indigenous gossans. Gold in the oxide paragenesis is extremely pure (99% Au) suggesting that chemical refining took place. Silver occurs mainly as iodargyrite (AgI), and minor AgBr, AgCl, in botryoidal aggregates. Particles of Au-Ag alloy in the primary mineralization exposed to a weathering environment can be leached and transported by various agents (chemical and biochemical) that may exist simultaneously. In the presence of halides, gold and silver can be leached and transported in a wide range of pH-Eh conditions, especially if iodine is present. Silver is leached more rapidly and over a broader range of pH-Eh conditions, and is preferentially transported as iodine-complexes than other halides. The presence of iodargyrite in the Cerro de Maimón gossan, fully developed under tropical conditions, suggests that this mineral cannot be considered an indicator of extremely arid environments as typically claimed by many authors; iodargyrite occurrence would rather point to the presence of saline-halide rich groundwater in oxide deposits. Aplicación de los isótopos estables en el estudio de los dipósitos minerales (Application of stable isotopes in the study of ore deposits). Abstract: The talk began with a brief overview, as a reminder, on the theory of isotopic equilibrium systems most frequently applied to the study of mineral deposits, namely isotopes of S, C, O and H. Dr. Cardellach pointed out the particularities and the information that provides each of these isotopes and isotopic pairs, focusing on its application for the identification of the origin of mineral fluids. In addition to theoretical considerations, Cardellach exposed a number of real examples applied to the study of deposits. Some of these examples included: wolframite deposits of Panasqueira (Portugal), Pb-Zn deposits associated to diapirs in the Basque-Cantabrian Basin, Pb-Zn deposit MVT type of San Vicente (Peru), Zn-Pb-Ag deposit Sedex type of HYC McArthur River (Australia) and veins of Ba-F-Pb-Zn of Atrevida vein (NE of the Iberian Peninsula, Spain). 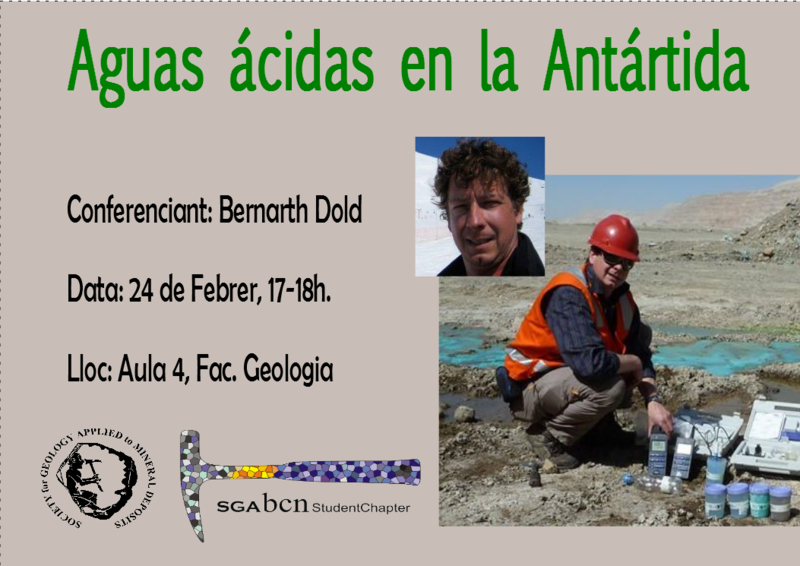 Biografical summary:Dr. Cardellach is former professor and researcher of Mineralogy and Mineral Deposits at the Geology Department (Universitat Autònoma de Barcelona (UAB)). 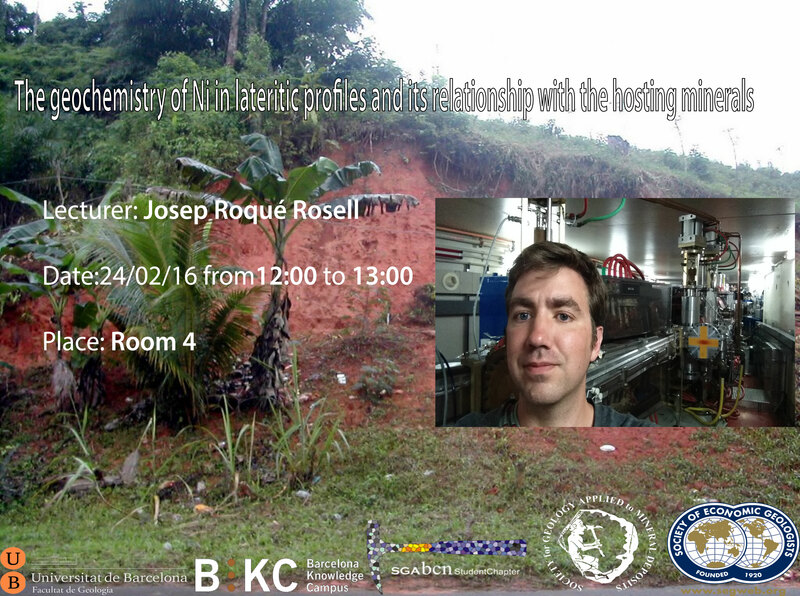 Great part of his research has been focused on the origin and evolution of mineral fluids. During his professional career has made research stays to Durham University and Yale University, where he worked on the geochemistry of stable isotopes. Recently he has been principal investigator on several research projects, the latest of which dealt with the study of epithermal Au deposit at Cerro Quema, Panama. 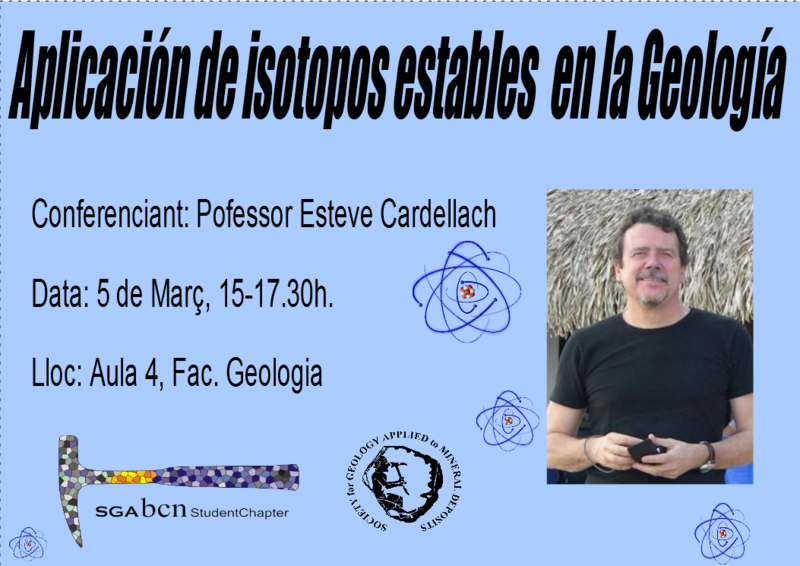 Currently, Cardellach is involved as researcher in a project led by the Universidad de Huelva (Spain) on Black Shales and massive sulfide deposits. Date: Tuesday February the 24th 2015, 17 hs. Abstract: Bernarth Dold is specialized in biogeochemical and hydrogeological processes controlling element cycles in ground and surface waters, soils, industrial waste environments, bioleaching operations, and ore formation. But how can acid waters be formed in Antarctica? Massive sulphide oxidation in cold climates has been scarcely studied, but it is known that these kinds of waters exist. Would their impact on local species be positive or negative? Expeditions to Antarctica have been performed to study both the biogeochemical cycling of iron and sulfur, in which has been observed a biogeochemical reduction process; Fe (III) to Fe(II), generated by microorganisms and submarine groundwater discharge. - The study undergone allowed us to understand the relationship between this phenomenon and the effect of the contribution of limit elements of the ocean food chain. - Research on sulphide oxidation in an extreme climate could help understanding the origin of life and the possibility of finding it in other planets. - Knowledge on this topic would be useful for mining operations located in cold areas like high Andes. Talk by Professor Carl E. Nelson, consulting economic geologist.